Normally I don’t do all that much with spaghetti squash but this year I have really been enjoying it and in particular in stuffing it with tasty things like lasagna or in this case chicken enchilada filling. The basic idea behind this is that you cut a spaghetti squash in half, scoop out the seeds, roast it, stuff it with chicken enchilada filling, cover it in cheese and then bake it until the cheese has melted. One of the fun things about stuffed spaghetti squash like this is that you can use small spaghetti squash and then just serve it in perfectly individually sized servings in the shell itself! I kept things nice and simple for the chicken enchilada filling going with shredded chicken, a light and tasty homemade enchilada sauce, black beans and corn and with the melted cheese topping your family will never know just how healthy this is or how many vegetables lurk underneath! What a great light, family fun meal! 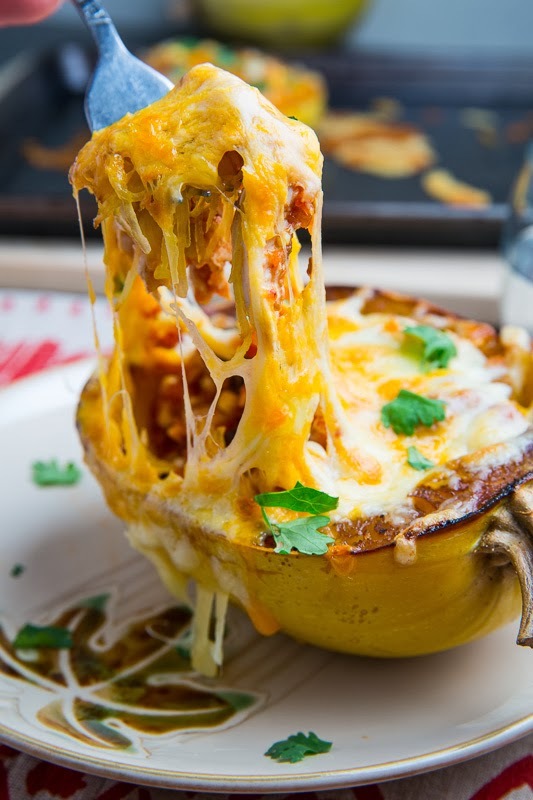 Just look at all of that ooey gooey melted cheesy goodness! I want to nap forever in that. About to get ingredients to make this, it looks amazing! quick question, what type of chili in enchilada sauce? Thanks! I can't wait to try this recipe! Looks amazing! Anonymous: That should be '1 chipotle chili in adobo' in the enchilada sauce. Perfect, thank you! That just sounds even better! love chipotle in Adobe sauce! can't wait to make this tonight! Yum! This looks so cheesy and delicious!! Cheesy goodness! Love the spaghetti squash! Yum! This looks delicious, especially since I love squash! Oh my!! This is seriously calling to me. I just swooned! My kind of stuffed veggie! Loving this recipe – my favorite way to eat veggies! Fabulous! 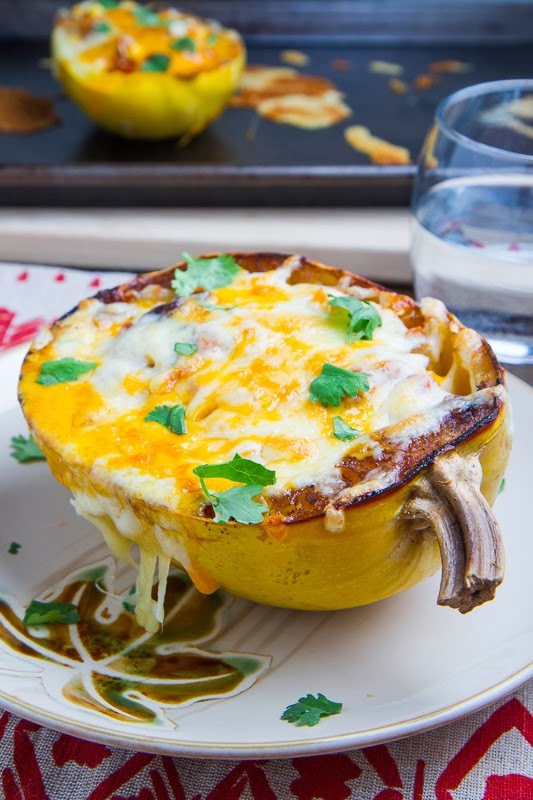 I never know what to do with spaghetti squash – well now I do! Will it have some crunchy texture? Love the shot with that drippy cheese!! 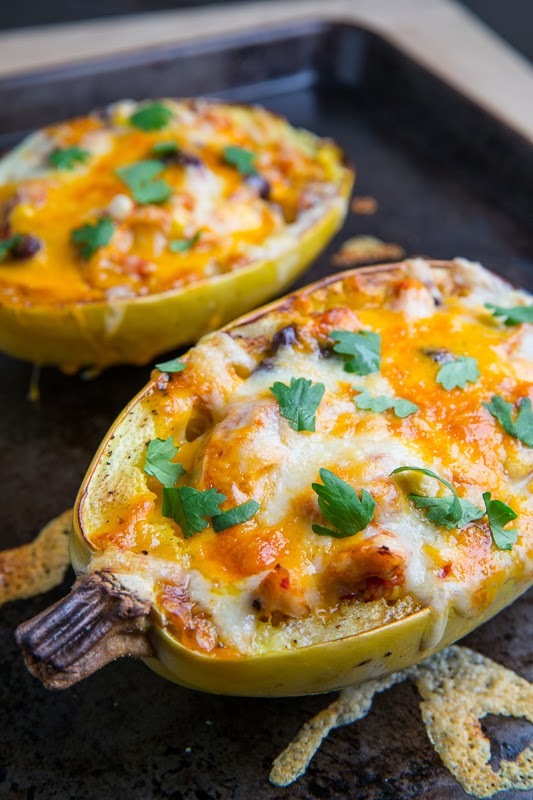 Love the spaghetti squash boats!! Great idea!! I actually haven't tried spaghetti squash yet but I'm sure that'll change VERY VERY soon! blushingdragonfly: The spaghetti squash is nice and tender. Kevin this looks AMAZING! I love the shot of the cheese dripping – it's so mouthwatering as are all of your photos! Just when I thought I couldn't love spaghetti squash anymore! This is my kind of comfort food. If you make a double batch of the yummy enchilada sauce, think it's okay to freeze for use at a later date? Do you think an acorn squash would work with this? The recipe looks amazing! Anonymous: This would be great in acorn squash as well! crystalgrant84: Yes, the echilada sauce freezes well! Kevin: thank you for your prompt response! I am really excited to try this recipe later this week! Oh my gosh, this looks amazing! It might have to be dinner tonight! Made this last night! It was delicious. I was sad we didn't have corn and fresh cilantro in the house.. I know that would have made it perfect. Still great. Such a nice way to skip the tortilla. 🙂 I'm loving your recipes. hollyeva: I'm glad you enjoyed it! I love working those extra veggies into the meal plan and always in a tasty way! I just want to thank you for this recipe. This was by far the best way I've had spaghetti squash and we eat a lot of squash! I could not get enough of the homemade sauce! And it's good on SO many things! SgtsWifey: This is 4 serving and the nutritional info is per serving. This looks so yummy! Just fyi… corn is not a veggie. It is a grain. Will you marry me and cook for me everyday? Made this tonight and it was yummy! So full right now. This will be a staple. Thanks for the recipe! Does the inside get scooped out or is the mixture placed ontop of the squash? Felisha Thomas: You loosen the squash up with a fork, leave it in the shell and place the filling in on top of it. Enjoy! Oh okay thanks Kevin, this is dinner tonight! Thanks so much for this YUMMY and easy recipe! We will certainly make it again and again! Here are some changes I made: I microwaved my squash (1 1.2 lb) 3 min to make it easier to cut open. I used 1 (10 oz) can of enchilada sauce — but all the other ingredients as listed. I still baked it for 30 min. But 2-3 min. in the microwave on high makes cutting it in half much easier. I found this on Pinterest! We've only, in the last year or so, discovered the joy of spaghetti squash! 😉 so I'm always looking for new ways to make it. I've made this recipe several times now. The first time I had a can of prepared enchilada sauce, but but I've made your recipe for the enchilada sauce twice now – it's pretty good & nice to be able to make my own if I don't have any on hand! Twice I've turned it to a kind of layered casserole. Makes for great leftovers & packed lunches! Anonymous: I'm glad that you like it! great recipe! I made it for my parents and wow they devoured these! Can't wait to make these again.. and then add some more spice next time 🙂 The amounts were perfect though – just the right amount for four "boats"
This is a phenomenal dish, Kevin! I used canned enchilada sauce, but otherwise kept to the recipe, and it was a huge hit in my house. And so creative! Your recipes have elevated me to Superstar status in the kitchen. I made this yesterday, it was a huge hit!